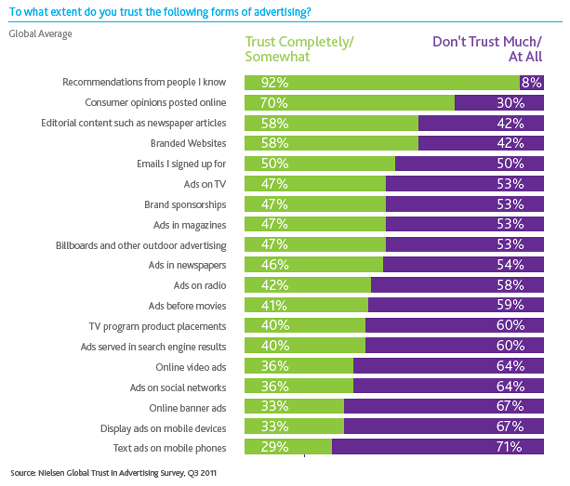 Nielsen’s latest Global Trust in Advertising report repeats findings from previous years – people don’t trust advertising, at least not as much as they trust recommendations from friends and consumer opinions expressed online. According to the report, which surveyed more than 28,000 Internet respondents in 56 countries, 92 percent of consumers say they trust recommendations from friends and family above all other forms of advertising – an increase of 18 percent since 2007. Online consumer reviews rank as the second most trusted source, with 70 percent of global consumers surveyed online indicating they trust messages on this platform, an increase of 15 percent in four years. Ranking third, fourth and fifth are editorial content (58%), branded websites (58%), and opt-in emails (50%) respectively. Traditional forms of advertising using media such as television, print, and radio rank lower, and have seen a significant drop – as much as 24% – since 2009. With its emphasis on friend-to-friend sharing, this bodes well for social commerce. For example, when we are uncertain about what to buy, it’s common for us to depend on the influence of friends. Therefore, integrating elements such as rating and recommendation systems, social sharing buttons and shop together tools is a smart thing to do. Nielsen findings indicate that editorial content such as that found in newspapers is trusted, as well. Normally, we associate such content with those we would consider being experts in their fields. So a reliance on expert voices – authority figures, celebrities, etc – is a wise move. Think Kim Kardashian at Shoedazzle, or Rachel Bilson and Kate Bosworth at Beachmint as examples. Tactics aside, what is of greatest importance is that your social media engagement be marked by authenticity and transparency. People want to be told the truth. They want their interactions with you to be validated by a genuine personal response. And they want the acknowledgment that what they have to say matters. And another thing – success in social commerce is not simply a matter of utilizing certain channels, or even maintaining a high level of engagement, but of providing a product or service that’s worth talking about. If you do, people will. And, if the Nielsen report has value, the earned media you accrue as a result will work in your favor.